Our Flugel Horn seat is taken by Jo Wild. Jo came to the band after teaching herself to play the cornet and hasn’t looked back! 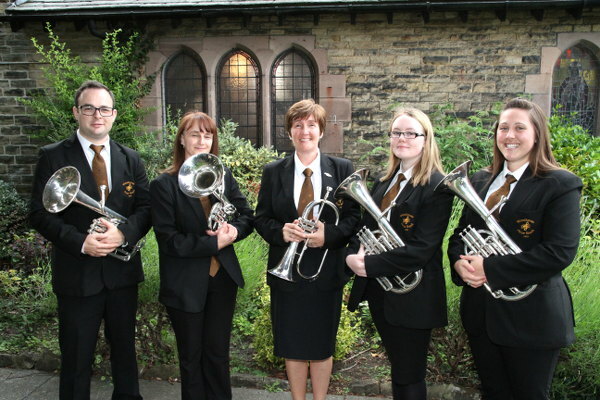 Jo played 2nd Cornet and gained in confidence and over the last couple of years has taken up the Flugel Horn. Jo has won most improved player and players player and continues to improve. Jo will this year stand up and play her first solo with the band – we are all very proud of Jo and her achievements! Our Solo Horn seat is filled with Helen Dye. Helen, was born into the brass-banding family and is also Graham Cook’s Grand Daughter. Helen has been playing in the band all of her playing life and has been our Solo Horn for a good few years now. Helen is also a want-to-be percussion player and will jump at the chance to play the triangle or tambourine! Helen is joined by Sandra Fretwell-Smith, Georgia Johnston and Samantha Deacon to complete our ‘all-female’ section! Pictured below we have Chris (yes, you may have spotted he’s not a female… Chris plays with another band, but as Gemma’s “other half” he helps out from time to time), Sandra, Jo, Georgia and Helen.